Principle of aerodynamic lift: are misconceptions also taught in flight schools? Describing lift as the result of "equal transit time" on both side of an airfoil is widely found in technical books and articles for general public. Is it taught this way in flight schools? Please note that the question is not about aerodynamics itself, but about what is (or was) usually taught to pilots. In particular: are (were) pilots provided with the limited view of the lift as being mostly due to the equal transit time constraint, a theory widely encountered in general public literature, but which cannot explain how a symmetric airfoil works. The two theories provided below are just concrete examples for illustration of what can be found in general public literature. Air has to move a longer distance on the upper side because of the curve of the profile (not correct for all wing profiles). Air on the upper side must travel faster than on the lower side because of the difference of distance to be traveled. By Bernoulli's principle accelerated airflow has lower pressure. Pressure is then lower on top of the wing, and higher on bottom. Hence the wing receives a force which has a vertical component upward. This component balances the weight of the aircraft, and allows to stay aloft. Such explanation, -a one that is very often used, including in aviation books- is a misconception. NASA explains that if lift is computed from fluid laws, based on airspeed on both sides of the airfoil, the result will not be in line with what is observed in real life. This theory cannot explain why a symmetrical airfoil works, or how an aircraft can fly upside down. NASA, identifies it's clearly an incorrect theory. To simplify, let's say the wing is traveling horizontally in the air. The wing, because of the angle for attacking the airflow, and also because of its camber, moves the air vertically, first upward a little bit and then downward in a greater quantity. 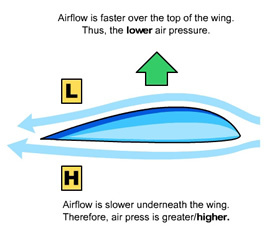 The airflow exerts a downward force on the air around the airplane, like a ramjet that would be vertical. According to Newton's 3rd law of motion "when one body exerts a force on a second body, the second body simultaneously exerts a force equal in magnitude and opposite in direction on the first body". Hence there is a reaction pushing the wing upward (like the ramjet is pushed forward), and creating the lift. Such theory, which involves a reaction force opposed to downwash can be found at NASA, here, and here. All details of lift are difficult to explain accurately. Lift involves both acceleration and downwash, in a ratio variable with airspeed, angle of attack, and airfoil. As pointed out by ratchet freak, there is a good discussion on lift theory in the Physics forum. I can only speak on behalf of the Australian Syllabus as put out by CASA (Civil Aviation Safety Authority - Australia), but we are expected to teach both Bernoulli's Theorem, and the Theorem of Air Deflection (I believe this is the second theory you are talking about in regards to Newton's Laws). BUT, we are also expected to teach these items as theories, not laws, as there is no law on the creation of lift. So to a degree, you could say we do teach misconceptions, but also at the same time we openly acknowledge those misconceptions to those we are teaching. The other part we openly admit is that both theories have merit to at least help understand certain important characteristics of Aerodynamics in-flight, great example is a stall. We have the Centre of Pressure that moves further forward along the Wing Chord as the Angle of Attack is increased, due to the "peak" of dynamic air pressure being more forward along the wing chord. At the "Critical Angle" in is at its most forward position. As soon as we exceed the Critical Angle, the wing is stalled and instantaneously, the Centre of Pressure moves aft along the chord line to a position approximately half way along the chord due to Bernoulli's theorem no longer having the principle effect on our wing. Now the theorem of air deflection takes over, and we look at using the "hand out the window of a moving car" analogy. We really don't worry about how a wing works that much. As far as I'm concerned, the technical explanation for how a wing works is a subject for the engineers who build and design such things. Private pilot applicants (at least all of the ones that I have met) are more concerned with things like "How do I get the plane into the air??" and "What do I do if it starts coming back down again in a hurry?" Some of the concepts presented in this chapter are wrong, but they are useful illustrations. The alignment of the wing to the relative wind displaces air downward, which creates lift. 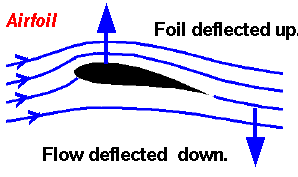 Because of the shape of the airfoil, air on top of the wing has a lower pressure than air below the wing, which also causes lift. And unless a student asks us for more information, we leave it at that. If you hope to become an aircraft designer or research fluid dynamics, you'll quickly be corrected of any misconceptions you may have about Mr. Bernoulli and his asymmetric wing.  Most student pilots, however, are satisfied with a pre-discussion "What we'll talk about today isn't technically correct, but you'll find it a lot easier to understand the necessary concepts this way." It is really not so hard to understand aerodynamics correctly, and you make it sound as if you prefer a short term gain over a profound basis which could help pilots to really understand what happens with their plane and to select the most appropriate action. Which is very true - it's not difficult to understand aerodynamics correctly. I'll defend my viewpoint with an analogy: Consider a store where you are shopping with a child who doesn't yet understand decimal addition. You have two purchases, one costing $5.08 and one costing $3.99. The child adds the big numbers and tells you that the final price will be $8. You now have (at least) two choices: you could begin a discussion of significant figures and fractional multiplication (can't forget tax! ), or you could praise the child for applying the skills they do have and getting an answer which is pretty close. Is it better if the child eventually understands how to calculate tax rather than simply trusting what the cashier reads off the screen? Of course. But at the stage where most of my students are, it's much more valuable to their development as pilots to simply praise them for being close enough. As regards JAL123, I am in 100% agreement with you. By the time you as a pilot have progressed sufficiently in your development to be flying something with a turbine pushing it, you should certainly know the principles and concepts of your machine to the highest degree of accuracy. I would like to add my $.02 to this question. Lift is defined (in the aerodynamic texts) as the upward component of the force that the air exerts on the wing. The force is composed of the tangential (sheer) forces that tend to contribute mostly to drag, as well as the pressure (normal) forces that tend to contribute to lift. As for designing the most efficient wing, the answer is trial and error. Hundreds of different mathematically-defined airfoils are put into a wind tunnel and their lift and drag coefficients are measured. They are then published in a book like this one for future aerospace engineers to decide which airfoil best suits their purpose. The question as to why the pressure happens to be lower on the top compared to the bottom of the wing is not really that important. Heaps of empirical data show that it is the observed phenomena, and we work with it from there, as unsatisfying as that may be. I was taught at Civil Air Patrol flight school in 1958 that the Bernoulli effect was the only way that a wing generates lift. I don't remember what our textbook was except that it was also used by the USAF. Our instructors obviously felt that this fact was not vital, and it appeared on no exams. As Steve V. says, we really didn't worry about how a wing works. A model airplane builder in our town flew a craft that was nothing more than a flat metal disk plus an engine, rudder, and elevons. It had a very long takeoff roll and was a beast to fly, but it was clearly flying the wing and not just hanging on its prop. It was, in fact, a 25" enameled steel Texaco Gas sign. No Bernoulli effect was possible. Also, we had seen many technical drawings of early Wright, Santos-Dumont, and Curtis aircraft, all with flat or curved wings of constant thickness over practically the whole chord. Clearly these aircraft did not generate a Bernoulli differential. We had lots of evidence that Bernoulli was not necessary for heavier-than-air flight. So I would say that this misconception was taught in some flight schools in 1958, but it did little actual harm. Students who wanted to just fly ignored it and got on with just flying. Students who were interested in aeronautical science already knew not to accept any such simple explanation where fluid dynamics is concerned. Not the answer you're looking for? Browse other questions tagged aerodynamics flight-training theory lift or ask your own question. What is the equality theory, or equal transit time theory, and is it supported by scientific evidence? How do wings generate lift? How complete is our understanding of lift? What can a new student pilot do on their own to prepare for class and instruction? How does Bernoulli's principle contribute in lifting airplane? What is the actual air speed over and under a wing due to Bernoulli's Principle? How does downwash change relative wind? Why the dynamic pressure is not mentioned in the explanation of lift by Bernoulli's theorem? What amount of lift would be created in the fallacious “lift from equal transit time” theory? Is lift created by air downwash? Which are some planes shaped like an inverted wing? What is the physical meaning of circulation found in Kutta condition?